I generally prefer a radler over a shandy only because radler is German for cyclist and shandygaff is much harder to say with a straight face. 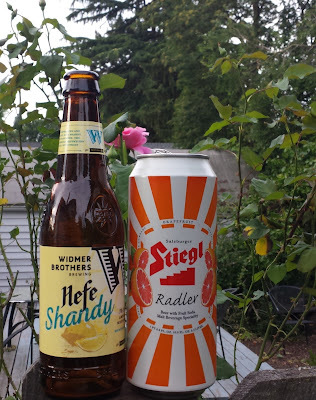 We* went side by side with Widmer's Hefe Shandy and Stiegl's Radler and the results were pretty clear in the first few drinks. Stiegl came our swinging like a soda with a bit of something else, while the Hefe Shandy was most certainly a beer. It was very lemony, light and low AC, but very much a beer. It's a good hot weather* beer and went well with a batch of fish tacos on a sunny evening. I've had a few of Widmer's hefes* and while this is in the range, it's not the same beer that had become ubiquitous in craft brewing. Not only did Widmer mix their flagship Hefe with lemonade, but added Lemon Drop hops to the mix. These aren't a hop I've ever brewed with or even seen at my local homebrew shop. Something new here for beer-nerd, but oh-so accessible. It all comes together as sweet, but not a soda. A beer, but not a mass market lager. An easy drinking session beer just waiting for a bar-b-que. * more than a few, but we'll leave it at that. There are so many different ways to pair beer. I've paired beers with food (stout and chocolate chip cookies), with company (IPA's with certain friends, pilsners for another), with sporting events (Lompoc's Kick Axe for a Timbers game), with season and weather (Imperial Stouts in a winter storm and a Kolsch in the summer heat), with location (8 Ball Stout when I'm back in Humboldt). Another important pairing type is with driving. No, I'm not picking out a beer to drive with, but I definitely consider what kind of beer I'm going to have if I have to drive in the near future. Now I love imperials and I like to go big on taste and ABV, but that does not pair well with driving. 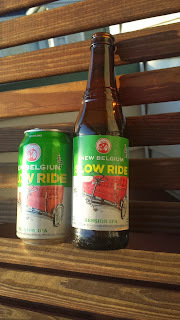 New Belgium's Slow Ride Session IPA works well. Your mileage may vary, but I feel very comfortable with enjoying one of these when I know a drive is coming soon. With a 4.5% ABV a BAC calculator returns a 0.01 in the 1st hour and a 0 after. Low ABV does not have to mean low on taste. Looking up this beer on NB's site I was not surprised to see the high number of hops used. They pack in 8 different varieties with Mosaic and Nelson Sauvin in the lead (Amarillo, Citra, Mosaic, Simcoe, Nelson Sauvin, Nugget, Centennial and Cascade in all). 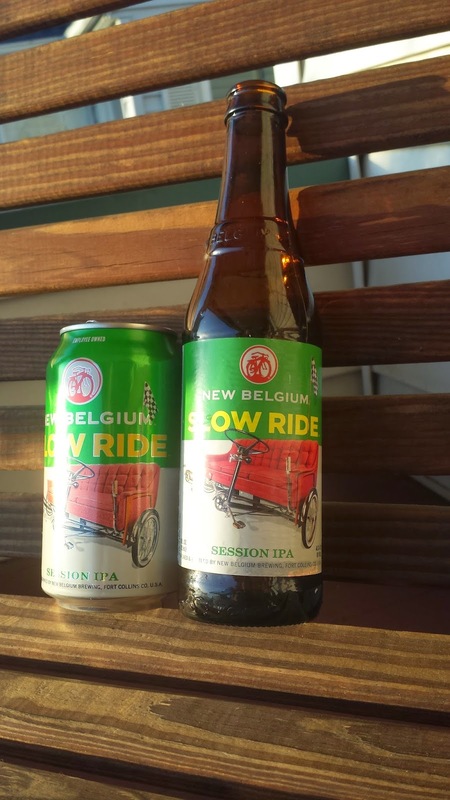 Slow Ride is light and a bit sweet with a very noticeable hop bitterness that swings heavily on the fruity side for the hops. Drinking and driving is not cool. If you are going to have something to drink before you drive make sure it is low in ABV and high in taste. Though, if I'm relaxing on my porch swing, that's another story. Everything in moderation, including moderation. Like many beer drinkers my first tastes of beer were mass market American lagers. For many years that was the only variety of beer that I knew existed. As I and the American beer culture matured my horizons expanded as the variety on the shelves grew. There is still a time and place for those American lagers, but mostly I've moved on. 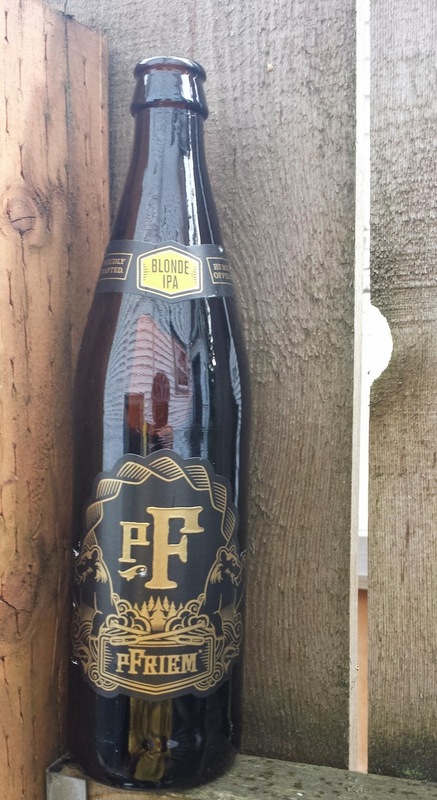 Pouring pFriem's Blond IPA was a blast to the past at first look. It came out pale, yellow and clear. This looked like the beer of my youth! Unlike most craft breweries, pFriem filters many of their beers. While some may argue that flavor is stripped out, this beer did not suffer from lack of flavor and looked great in the glass. The similarities stopped at the first smell and sip. Hands down, this beer is great. It is light and clean with a great, but understated hop flavor coming through with tropical guava like flavors. pFriem says their secret ingredient is sunshine and I can believe that. I was indoors on a cool spring evening, but would like to revisit this beer outside on a hot day. Crisp and refreshing, like the lagers of my youth, but now with flavor. I'm very happy to see pFriem now carried in bottles at my nearby New Seasons and looking forward to my next taste.